Let me go back to the first time I used this recipe. It was for our drink tasting party, and I had a hankering for peanut butter blossoms. I honestly thought my grandma made the best, but I was wrong. I made half the batch with peanut butter cups – I didn’t have kisses and wanted to use up what I already had in my baking cabinet. The other half I got kind of creative with. I have almost a case of Nestle Crunch bars (thanks, Dad! ), so I figured I’d try chopping a few up and putting them in. Yeah, it was the bomb. I made a double batch for my husband and his boys, who left me for the weekend to go on his annual ice fishing trip. Too bad for him it’s -20 degrees, probably colder where he is going. But maybe the cookies will help keep him warm, or the booze. You decide. 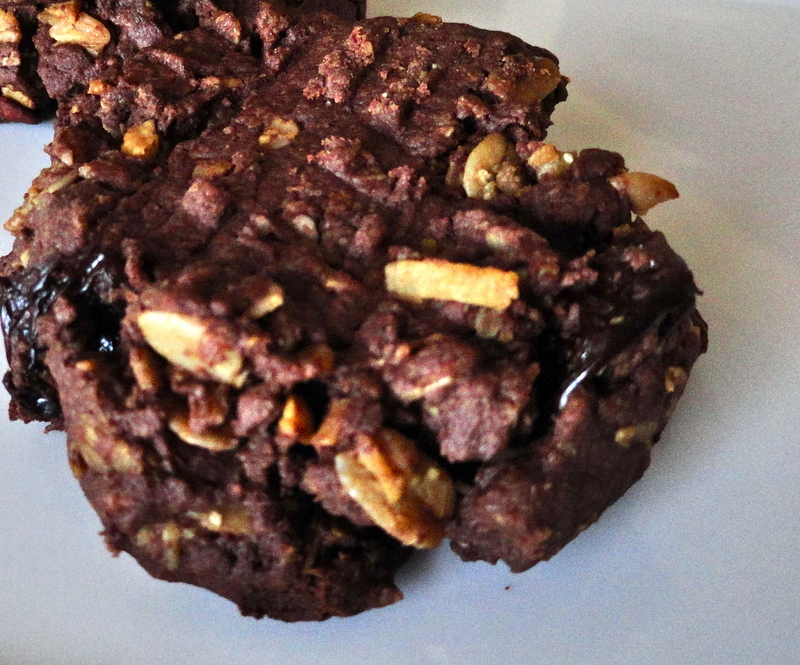 Anyway, these cookies stay nice and thick, but remain soft and chewy – and not just for the day you baked them. They stay soft for days, which is awesome! 1. In the bowl of a stand mixer, cream butter and sugar at medium speed. One at a time, mix in peanut butter, egg, then vanilla, scraping down sides as needed. Slowly mix in baking soda and flour until just combined, careful not to over-mix. **This is where I added two chopped up Crunch bars. Use your own add-ins (chocolate or white chocolate chips, raisins, M&Ms, Kisses, caramel, or anything else you like) or just keep them deliciously plain. Wrap dough tightly in plastic and refrigerate for at least 30 minutes. 2. Preheat oven to 350 degrees. Prepare baking sheet with foil, parchment paper or cooking spray. Roll dough into approximately 1-inch balls, about 2 tbsps., and place on prepared baking sheet. Bake for 8-10 minutes (mine took exactly 10 to be perfectly soft, but this will vary based on ovens and size of cookies). Remove from oven, and if desired, press fork crosswise into each cookie softly. Let cool slightly on baking sheet, then transfer to wire rack to cool completely. 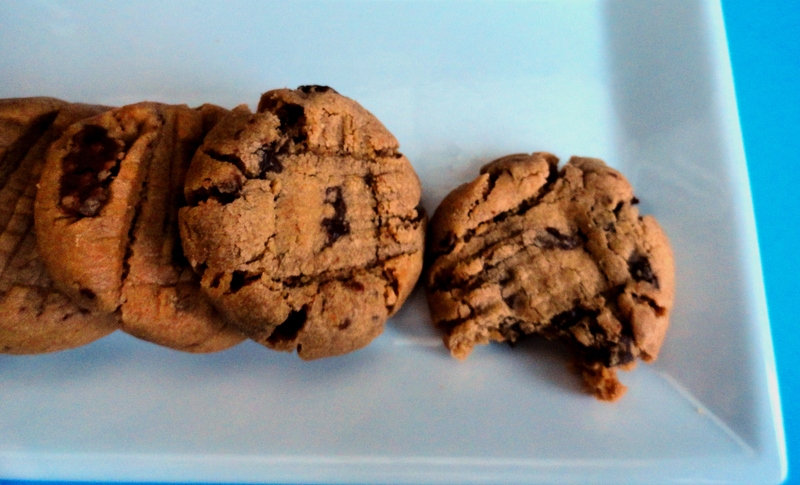 I love peanut butter cookies, and I wanted to bring something sweet to share over the weekend while camping, so I thought, what a perfect chance for me to make a batch! 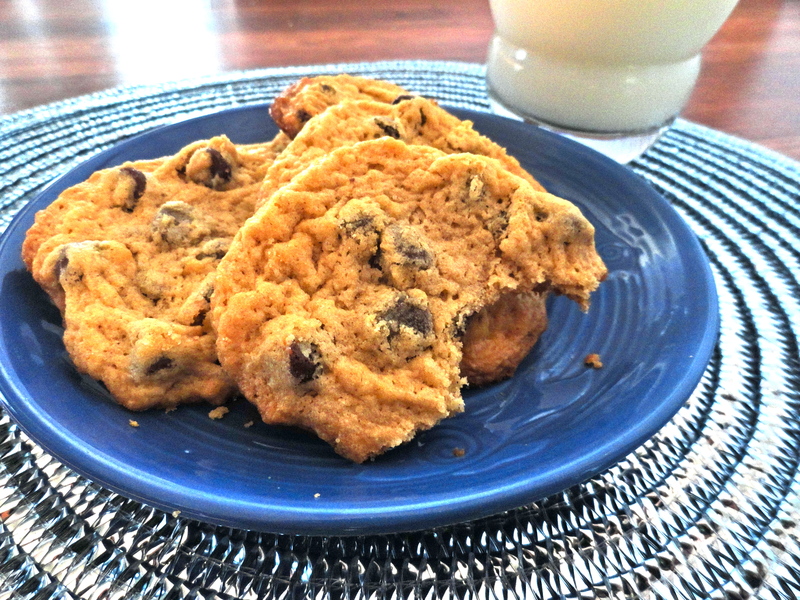 I loved my Grammie’s cookies growing up, but they were always hard, and I prefer my cookies soft and chewy. I went in search of a tried and true recipe on my trusty cooking board, and then I was now stuck in the position of choosing which recipe to make. I decided to go with Jessica’s recipe from Sunny Side Up. I’ve never made anything from her blog before, so I was happy to once again, find some new ideas! 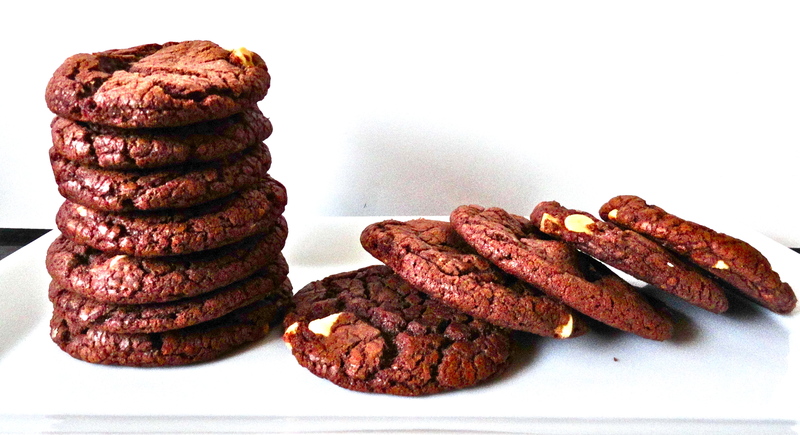 The reason I settled on these cookies was more because of the story that went with them. 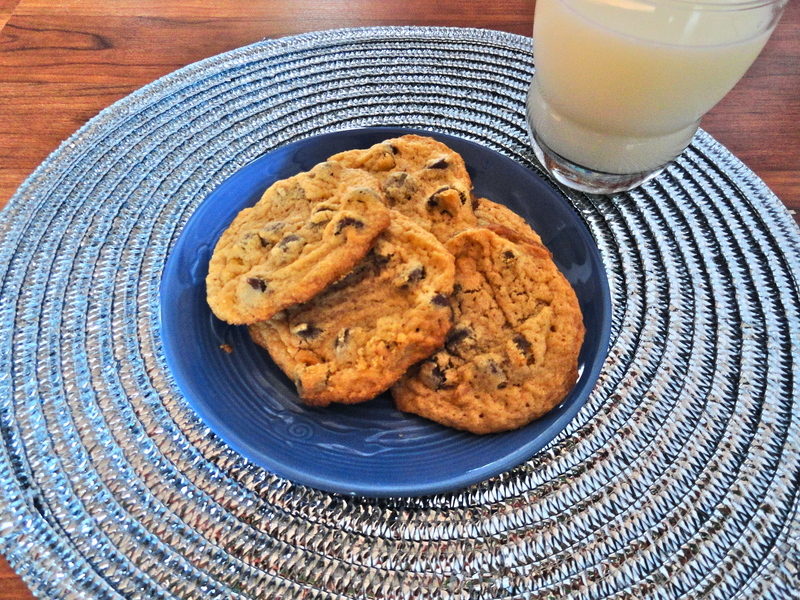 These cookies were in her husband’s top 5 recipes that she makes. That’s saying a lot, so I thought it was the perfect recipe to try out. I especially loved the addition of the chocolate chips. 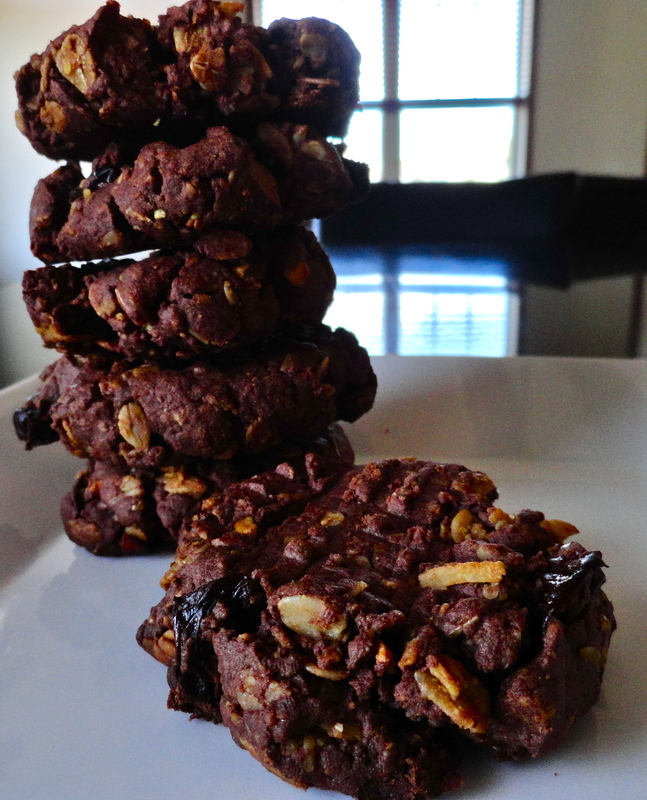 The cookies, while quite thin, turned out delicious. They even made a great substitute for graham crackers in s’mores! Note to self, bring everything you can think of if you go on a camping trip that Leah’s husband packed for. The cookie wasn’t too crispy, but not so soft that they just seemed under-baked. The addition of the chocolate chips was wonderful, because who doesn’t like peanut butter and chocolate in holy matrimony? Certainly not me. 1. Preheat oven to 350 degrees. Prepare two baking sheets with foil and cooking spray. 2. In a large bowl, combine flour, baking soda, baking powder and salt. Set aside. 3. In the bowl of a stand mixer, cream butter and peanut butter together. Add sugars and continue to mix until light and fluffy. Add egg, milk and vanilla extract until combined. Slowly add in dry ingredients until everything is incorporated. Stir in chocolate chips. 4. Roll a rounded tablespoon of dough into a ball, dip top into sugar, and place on baking sheet. Press tines of a fork twice (crosswise) into each cookie lightly. Continue until baking sheet is full (I omitted this step as my dough was too sticky). Bake cookies for 10-12 minutes. Mine took exactly 11 minutes, but every oven varies, so keep a close eye on them. Remove from oven, let cool on pan for 1 minute, then transfer to wire rack to cool completely. Remember when there used to be only two or three kinds of Girl Scout cookies? At least I feel like there were. There are so many different kinds these days, it’s hard to decide. Maybe that’s how those girls get you to buy more boxes – more options. Sneaky! Regardless of how many choices we have, the most popular Girl Scout cookie are the thin mints (followed by Samoas – my personal favorite). Admit it, even if you don’t buy them, you love them! Someone at work bought them and shared them (who knows why), you stopped over at a friends’ and they happened to have them, or better yet, you’re house sitting someone’s house and you find some in their freezer and sneak a few. Admit it, you snoop through their fridge and freezer 😉 But, no longer do you have to sneak your favorite Girl Scout cookie because these ice cream sandwiches are your perfect fix! As a dessert for my aunt’s cookie exchange, she originally suggested doing an ice cream sandwich. Then, she sent me a cookie sandwich recipe with a peppermint frosting filling. I was about to go with that, but decided we should do the ice cream sandwich, and use the chocolate cookie recipe she suggested, but fill it with mint chocolate chip ice cream. What a fantastic idea! Before serving them, I warmed the cookies (since they were already baked before the event), then scooped some ice cream over one cookie and topped with another, and BAM! These were so amazingly good. They tasted like a SUPER thin mint, but of course, even better! The warm chocolate cookie with the melty ice cream in the middle was a match made in heaven. You need to make these for your next party…or just because! 1. Preheat oven to 350 degrees. In a saucepan, combine butter, brown sugar, water and chocolate chips. Melt together over a low heat, stirring constantly. Once melted, remove from stove top and transfer to the bowl of a stand mixer. Let cool slightly. Beat in eggs and vanilla. 2. In another bowl, combine flour, baking soda and salt. Slowly add flour mixture to chocolate mixture while beating. Mix until well combined. Using your hands, roll 2-inch balls of dough and drop onto a prepared baking sheet. Leave plenty of room between the cookies (I only put 6 on a sheet) as they spread nicely. Bake until just cooked through, about 10 minutes. Remove and let rest for 2 minutes before transferring to a wire rack. 3. Taking one cookie, top side down on a plate, scoop two small scoops of ice cream and top with another cookie. Repeat for remaining cookies. Serve immediately, or wrap each tightly in foil and store in freezer in a zip-top bag. The only thing I can think of when I hear Nutella is Giada De Laurentiis, AKA bobble-head. Her head is huge if you haven’t noticed (well, huge for how tiny her body is). Also, she’s not so nice. At least, that is what came across on the latest Next Food Network Star season. Bobby has always been my favorite, but I really have grown to love Alton Brown. Even Nate, who has (or had) Giada on his list, says he’s not such a big fan after watching her. She was just so mean to her team and the other mentors; she seemed like a diva to me. Back to the cookies. I don’t think I’ve ever actually purchased Nutella, but I know I’ve had it because I know I like it. I happened to buy it because I couldn’t find chocolate peanut butter at my local grocery store to make 3 ingredient chocolate peanut butter granola cookies. I ended up finding some at a different store, but I still had the Nutella on hand, so I needed to make something with that. Since our 3 ingredient cookies are almost to the end, I decided cookies wouldn’t be such a bad idea. Plus, I can always bring them to work and they’ll be gone within the day. The original recipe didn’t include the white chocolate chips, but I thought they looked a little plain without, so I went ahead and added them. 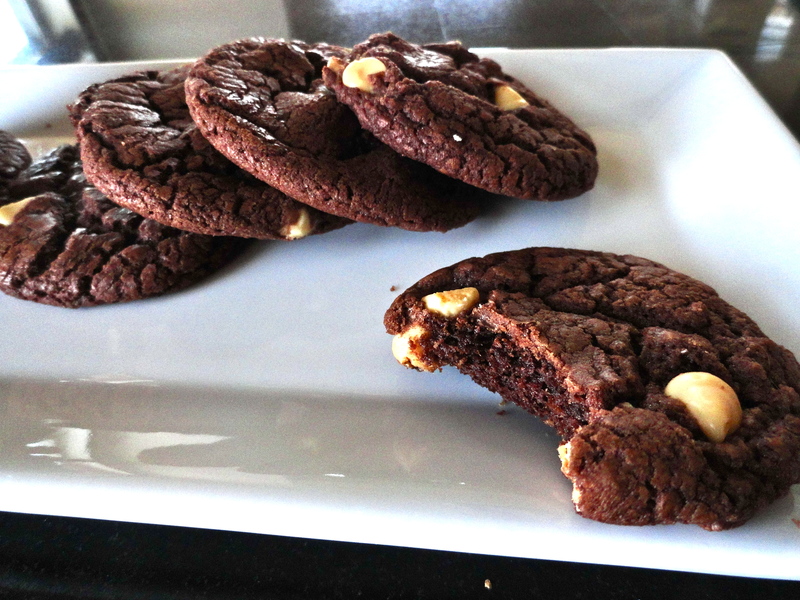 They were super yummy, and the coco powder with the hazelnut butter is a real winner. 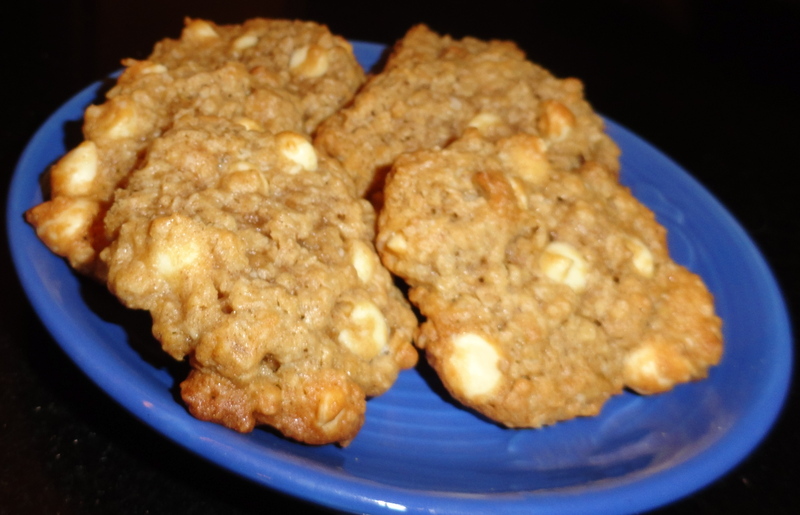 The white chocolate chips gives the cookies a little crunch and an added flavor element. They would have been great without them, but I liked the addition. I tried to pull them out of the oven just a little before they were cooked through, but they still got a little crisp. I generally like chewy cookies, but these were really good, even with the crunch. 1. In a large bowl, whisk flour, coco powder, baking soda and salt. Set aside. 2. In the bowl of a stand mixer, cream butter and sugar. Add eggs one at a time and beat until well incorporated. Add Nutella and vanilla and continue mixing. Slowly add in dry ingredients. The mixture will become very thick. Remove bowl from stand mixer and stir in white chocolate chips. Cover bowl tightly with plastic and refrigerate for at least 4 hours. 3. Preheat oven to 350 degrees. Prepare baking sheets with parchment paper or cooking spray. Roll dough mixture into 1-inch balls and place on cookie sheet. 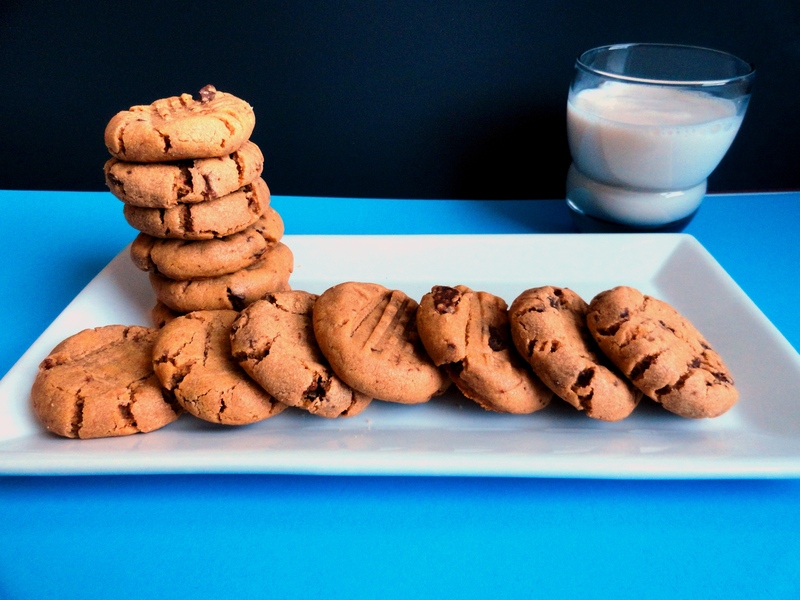 Make sure to leave plenty of room between cookies as they spread quite a bit. Bake for 12-14 minutes, until almost cooked through. Remove from oven and cool on wire rack. 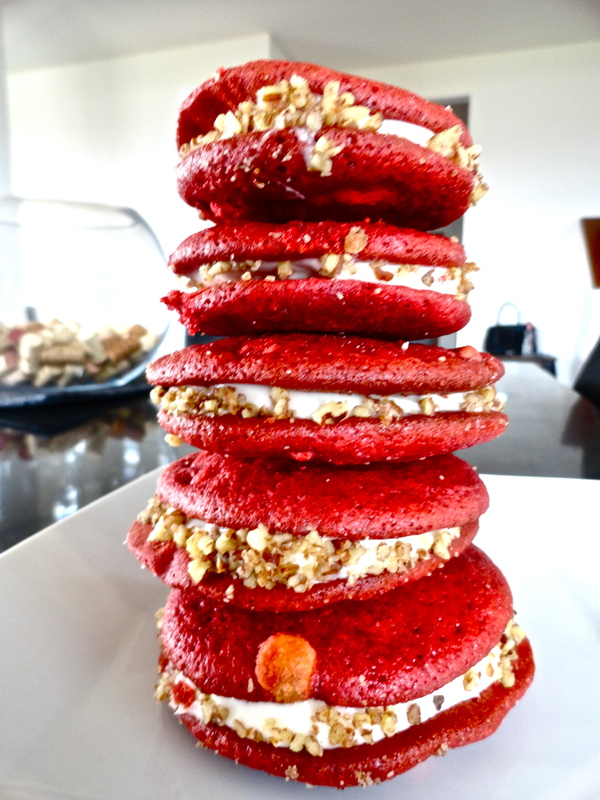 These little devils are a great fix for a red velvet cake craving. Basically, it is cake made into a cookie, with cream cheese frosting in the middle of two cookies. Brilliant! This is the first (likely the only) time that I made a Paula Deen recipe. As I’m not a competent baker, I followed the cookie part precisely. The frosting however, seemed a little too “Paula Deen-y” to me, so I lightened it by omitting two sticks of butter and two cups of sugar. Seriously, why was that necessary?? Don’t get me wrong, it’s not like the frosting I made was healthy by any means, but I really didn’t think the butter and extra sugar were required. You definitely won’t be able to tell anything is missing from this frosting. It made far too much frosting, so for the recipe below, I halved everything. I’ll have to make another batch of cookies just to use up the rest of this frosting! I also added some white chocolate chips to the cookies for a little crunch. The cookies were ridiculously moist! I couldn’t even stack the cookies on top of each other once they cooled as they would stick together. As I mentioned before, they basically are cake. The result was far from disappointing. The soft cake cookies with the tangy cream cheese frosting in the middle, with an added crunch of white chocolate chips were heaven. They even look fancy too with the pecans! 1. Preheat oven to 375 degrees. In a medium bowl, whisk together flour, cocoa powder, baking powder, baking soda, and salt. 2. In a stand mixing bowl, cream together butter and sugar until light and fluffy. Add eggs one at a time, then beat in buttermilk, vinegar, vanilla, and food coloring. Once combined, add dry ingredients and mix until well combined. 3. On a baking pan lined with parchment paper, drop batter with a large spoon or ice cream scoop in 2-inch rounds. Keep cookies well spaced out. I could only fit 6 cookies on a sheet a time so they wouldn’t run together. Bake 9 minutes, or until just cooked through. Let the cookies sit on warm baking sheet for another minute, then place on wire rack to cool completely. 4. In a stand mixer, beat cream cheese until smooth. Add vanilla and powdered sugar one cup at a time. Mix until well combined and creamy. Refrigerate for at least 1 hour to firm up the frosting. 5. Spread the cream cheese frosting between two cookies and roll in chopped pecans. I had a craving for oatmeal cookies, and happened to have some extra oats lying around. 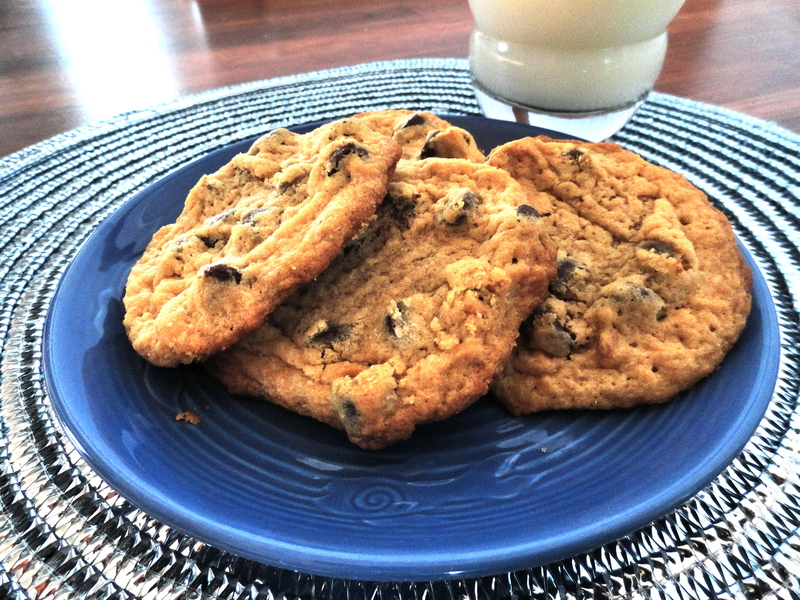 I found this great recipe from Smitten Kitchen. I don’t mind a good oatmeal raisin cookie, but I really wanted to try something new. I had a bag of craisins, but ended up using the whole bag for breakfast bars. So then I thought I’d use chocolate chips, but when I remembered there was cinnamon in the recipe, I thought white chocolate chips would be perfect. Thankfully I had some in my cupboard. Nate doesn’t really care for oatmeal cookies, but he really liked these. Get creative and add whatever chips or dried fruit you like, maybe throw a nut in there! 2. In a large bowl, cream butter, sugar, egg and vanilla until smooth. In a separate bowl, whisk flour, baking soda, cinnamon and salt. Add flour mixture into the butter/sugar mixture. Stir in the oats and white chocolate chips. 3. Scoop dough on a parchment lined baking sheet. 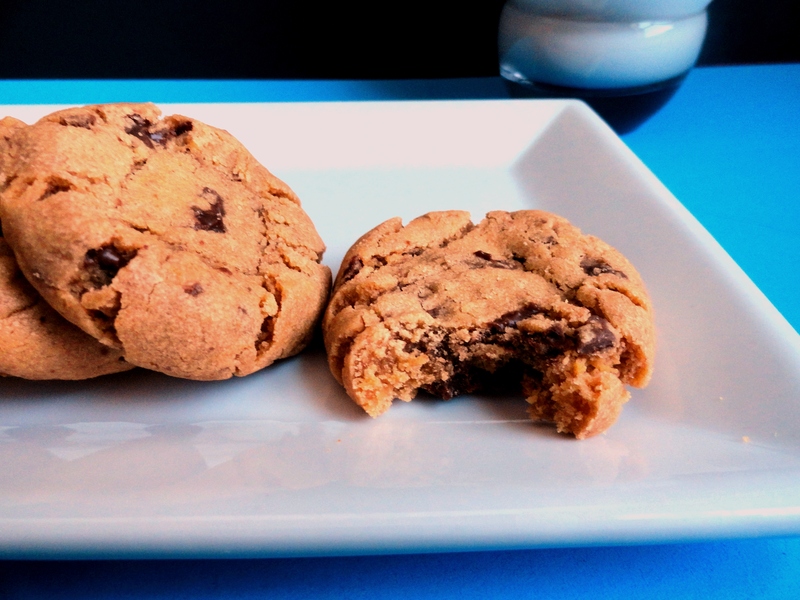 For thicker cookies, the original recipe suggests you chill the dough in the fridge and then scoop it. I didn’t do this because I was impatient, but I thought they still turned out great. Bake for 8-12 minutes. Mine took exactly 9 minutes. Remove from oven and transfer to a cooling rack.